Not sure what to sell online? 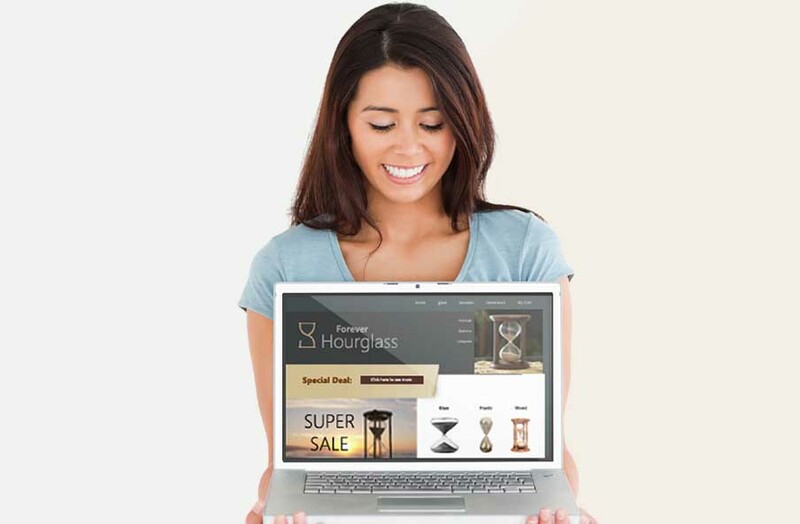 The Sell Niches Bundle shows you how to pick the BEST products to sell in new online stores. 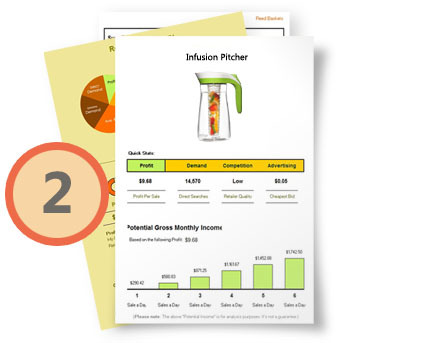 Using easy product research tutorials, powerful product research sheets and 100’s of niche product ideas, you’ll know exactly what products you should be selling online. You’ll Know What Products To Sell Online! Our method is simple. You’ll start by learning (step-by-step) how professionals pick great products to sell online. Our How-To’s and Tutorials are even used by Business Teachers! 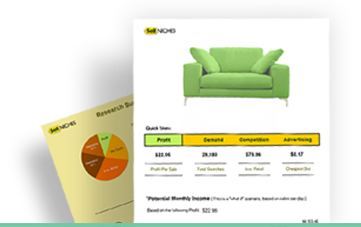 Next, you’ll use the Sell Niches Research Sheets (specially designed for Online Sellers) to organize and summarize your research into easy-to-read charts and product information. When you’re finished with the Sell Niches Bundle you’ll know what to sell, what not to sell and will have discovered product niches you can truly build a solid online store around. 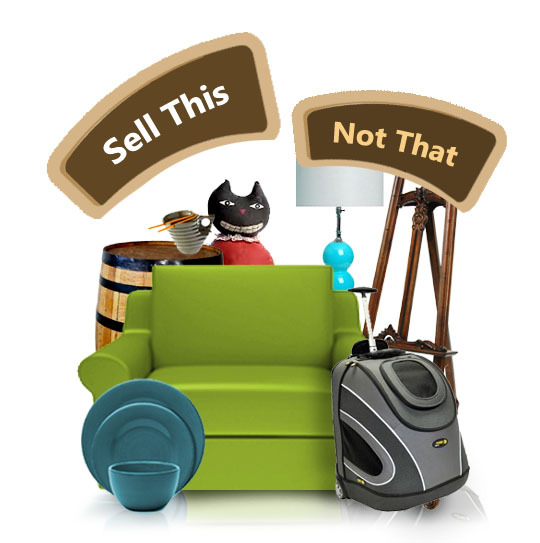 Not sure what to sell online? Online Retailers are finding out that niche product markets have less competition, lower advertising costs, better profit margins and provide plenty of customer traffic to sustain a solid online business. 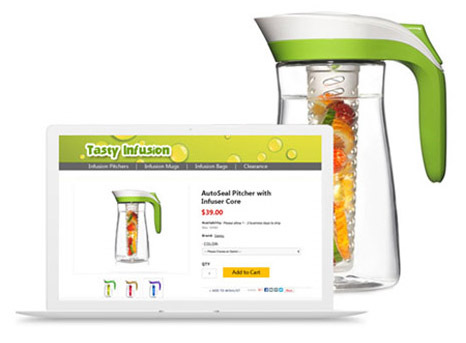 In fact, when you uncover an untapped niche market YOU can literally become the “go-to” store for that product online. 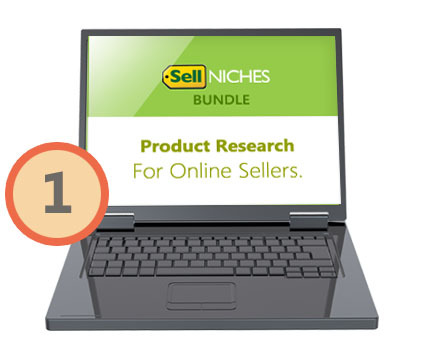 The Sell Niches Bundle takes the guesswork out of deciding what to sell online. Knowing how to fully research any product BEFORE you try to sell it is a skill every online seller should have. We walk you step-by-step through the same product research techniques professionals use to decide what to sell online. Our tutorials are made for Beginners. NO EXPERIENCE REQUIRED. 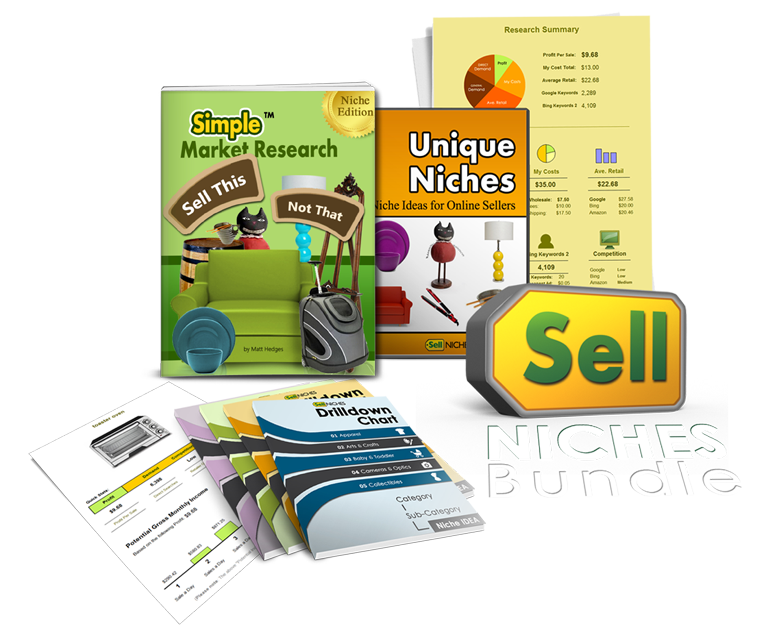 The Sell Niches Bundle contains easy Research Sheets made specifically for new Online Sellers. Simply enter in product research information into fields and let the Sell Niches Research Sheet do the rest! 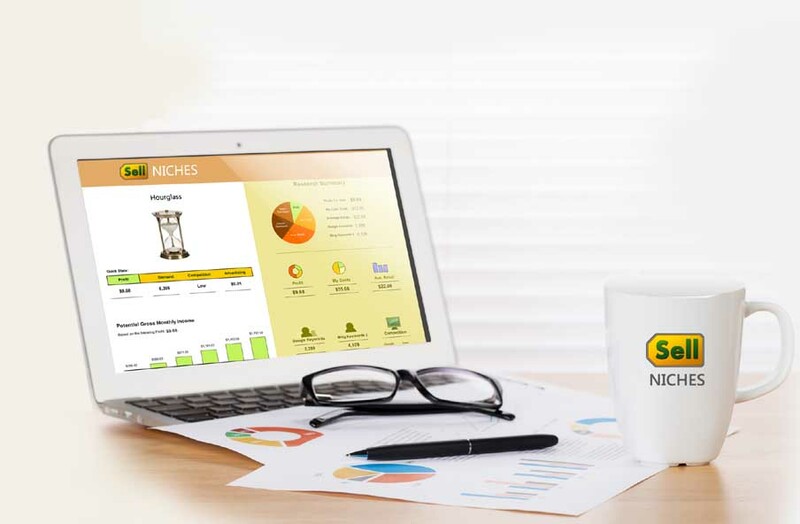 Our sheets organize and automatically chart your product research information into clean, organized summary pages displaying Profit, Potential Income, Competition and more. Comparing products to sell has never been easier! 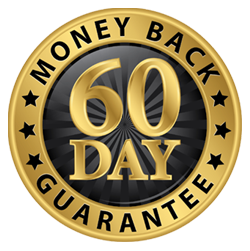 The Sell Niches Bundle allows you to move forward with confidence. You’ll know exactly what to sell in your Online Store or Amazon or auctions because you’ve done the research. Your product choices will be based on current research, not guesses. You’ll discover the perfect niche market that you can compete in! Excellent learning experience. It takes the tricky matter of correctly performing full market research and helps make it as simple as possible for a wide audience. But more than that, it shares real knowledge from first hand experience applying that knowledge and seeing successful outcomes. It’s well worth the price. I haven’t found any other book on the subject that offers the advice, counsel and opinions with such a high quality as Simple Market Research. Absolute requirement for anyone in ecommerce. 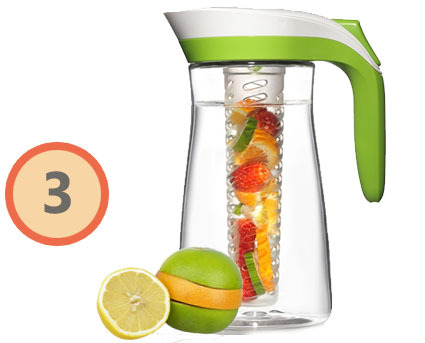 The Sell Niches Bundle has helped many of my Members pick great products to sell. If you don’t know what to sell or you are not sure if the product you want to sell is a good idea, then I highly recommend getting The Sell Niches Bundle. I don’t just recommend The Sell Niches Bundle to my own personal students, I make it a REQUIREMENT. It’s that good. Sell Niches Bundle is a must for everyone considering an internet business. This E-book is one of the legitimate sources for start up information. It probably has saved me thousands of dollars in the pitfalls of Ecommerce. Matt Hedges the author has been very supportive in answering any follow up questions. Thank you for providing such a useful product. 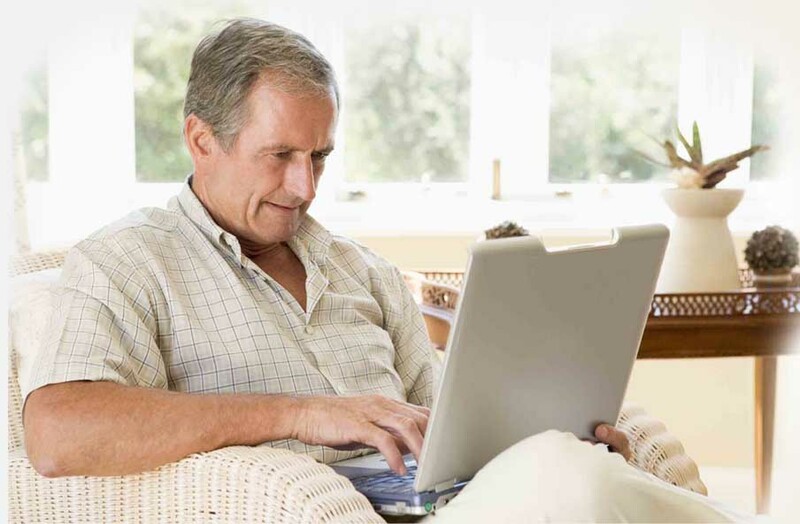 Know Exactly What To Sell Online. If you’re not sure what to sell online then the Sell Niches Bundle is for you! There are thousands of untapped niche markets that are ideal for new sellers. Don’t guess what to sell, do some research! We’ll show you how.